Dianna Booher found herself with only 10 days of cash flow. She made a huge investment in developing people and was now faced with making a decision to lay them off. She was able to avoid that decision and shares what she learned and how to prevent it from reoccurring. Dianna was born in Bynum, Texas, a small farming town in central Texas, where she and her younger brother Keith were helping her dad and mom pick cotton and hoe corn before she was four years old. Fed up with farming, her dad got a job as postmaster and the family later moved to Arlington, Texas, where she attended her last two years of high school. And by that time, a baby sister Angela had arrived to delight the family. Dianna was the first of the extended family to go to college and also to go on to receive her Masters in English literature. Growing up, Dianna was always involved in sports—either playing basketball, volleyball, or cheerleading for varsity football. Between sports and her many church youth activities, she had opportunity to interact with many great coaches and strong leaders who shaped her thinking and instilled a passion to help others. From those experiences, it was a natural to want to influence the lives of others in the same way—to help young people learn decision-making skills and communication skills just as she’d learned at the feet of her parents, coaches, sponsors, and church leaders. So she started out full-steam ahead: Finishing her undergraduate degree in three years and with a teaching certificate under her belt, her first few years were spent in the public school room. She taught junior-high Spanish and English literature to seniors. But after three years in the classroom and dealing with a husband struggling with severe depression (they eventually divorced and he’s now deceased), she decided to stay home and care for their two preschoolers herself while she earned her Master’s degree. The big question: How to continue to make a difference in the lives of youth? The answer: Write articles and books. She sent off the first article to a major magazine and an editor asked her to turn it into a book. Simon and Schuster went on to publish an entire line of her books for young adults. After more than a dozen nonfiction books and novels for the youth and general adult market, Booher turned her attention to the business market. When her first business book was released and her publisher sent her on a media tour, Shell Oil and IBM called to say, “Come out and talk to us.” Thus, Booher Consultants, a communication training firm began to grow into a multi-million-dollar firm that has been in business for the past 37 years, serving more than one-third of the Fortune 500. 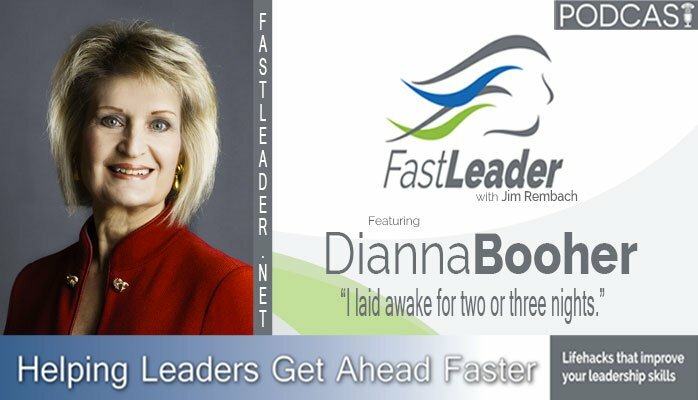 Dianna has gone on to found another company, Booher Research Institute, where she currently works and continues to write books, coach on executive presence, deliver keynotes, and consult with organizations to help them communicate a clear message. Her latest release (her 47th) is Communicate Like a Leader: Connecting Strategically to Coach, Inspire, and Get Things Done. Dianna currently lives and writes in Colleyville, TX with her husband Vernon of 28 years. You have to think both deeply and broader to move to the next level. Time. There are too many ideas to accomplish. Watch your cash flow. Get the best people, even if you have to go without. Do it now. Never put off tomorrow, what you can do today.